Tales of Hate, Lust And Chaos is the new album of Peruvian (!) 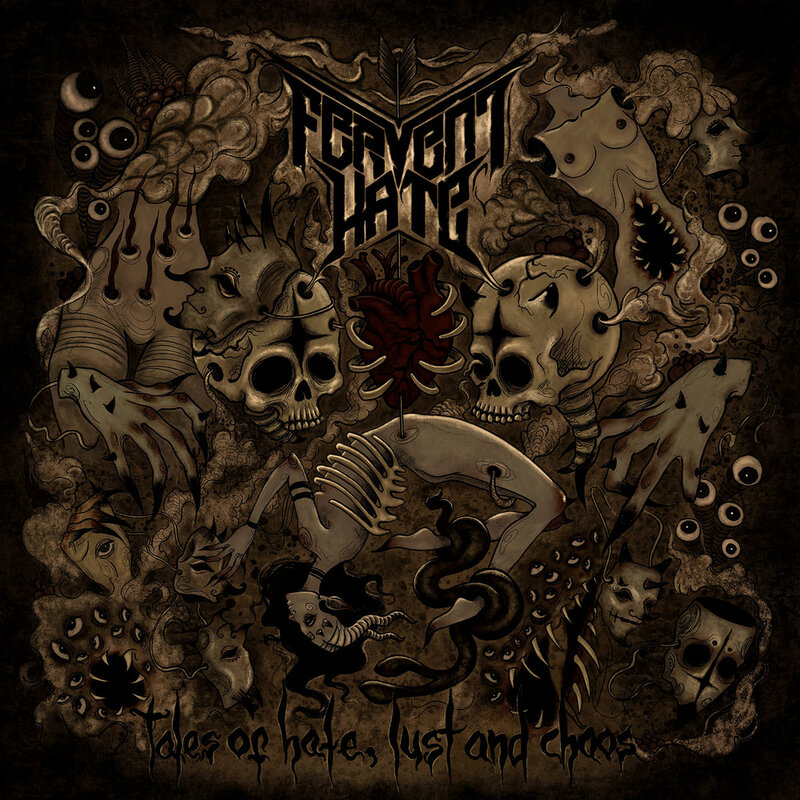 death ‘n’ roll project called Fervent Hate. Tales of Hate, Lust And Chaos consists of 10 very strong tracks that show the band on a mission, and with a musical progression, grinding, chainsaw & razor-sharp riffs, epic, melodic and catchy guitar solos and a powerful/brutal vocals respecting the death metal roots of this Peruvian (from a city named Arequiba) quartet. It comes as a follow-up to their highly-acclaimed 2013 debut Roads Of Insanity and a 2015 EP entitled Diablo. Tales of Hate, Lust And Chaos kicks-off with the opening assault of “Evil Twins”, with a typical death metal approach, but before you know it switches more into a slow-pace southern groovy and sludge sound. In other words; Tales of Hate, Lust And Chaos is a brutal and violent, yet beautiful and melodic death metal opus that will please most fans of the genre. A perfect example of genre-melting/blending is a third song called “Ten Inches Of Love” with both brutal slamming and southern sledge guitar parts to it. On the other hand you have a song named “The Possibility Of All Possibilities” which is a piece of melodic death metal at its best. Tales of Hate, Lust And Chaos was placed in the hands of the legendary Swedish producer, Dan Swanö (in the famous ‘Unisound Studios’) in order to achieve a powerful work with a lot of diversity and variety, and they pretty much succeeded. Technically, this ia a very good executed album where the song-structures are perfectly put together, and there’s almost nothing I would do differently. It seems as every song has the same amount of energy and momentum, leaving no weak songs.